ABSTRACT:- Deprived sub grade soil circumstances can result in insufficient pavement support and lessen pavement life. Soils may be improved by the addition of chemical or cementations additives. These chemical additives range from waste products to manufactured materials and include lime, Class C fly ash, RBI Grade 81, etc. These additives can be used with a variety of soils to help improve their native engineering properties. The effectiveness of these additives depends on the soil treated and the amount of additive used. Design of the various pavement layers is very much dependent on the strength of the sub grade soil over which they are going to be laid. The sub grade strength is mostly expressed in terms of Indian Bearing Ratio (IBR). 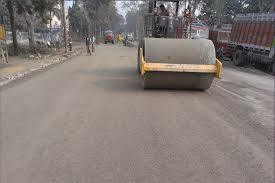 Weaker sub grade essentially requires thicker layers whereas stronger sub grade goes well with thinner pavement layers. The pavement and the sub grade mutually must sustain the traffic volume. The Indian Road Congress (IRC) encodes the exact design strategies of the pavement layers based upon the sub grade strength which is primarily dependant on IBR value for a laboratory or field sample soaked for four days. For an engineer, it’s important to understand the change of sub grade strength. This project is an attempt to understand the strength of sub grade in terms of IBR values subjected to different types of stabilizers. Treatment with cement and lime was found to be an effective option for improvement of soil properties, based on the testing conducted as a part of this work. It was found that with the addition of stabilizers i.e. cement and lime, the I.B.R. increased up to a certain limit but after that the I.B.R. decreased even on the further addition of stabilizers. Sub grade stability is a function of a soil's strength and its behaviour under repeated loading. 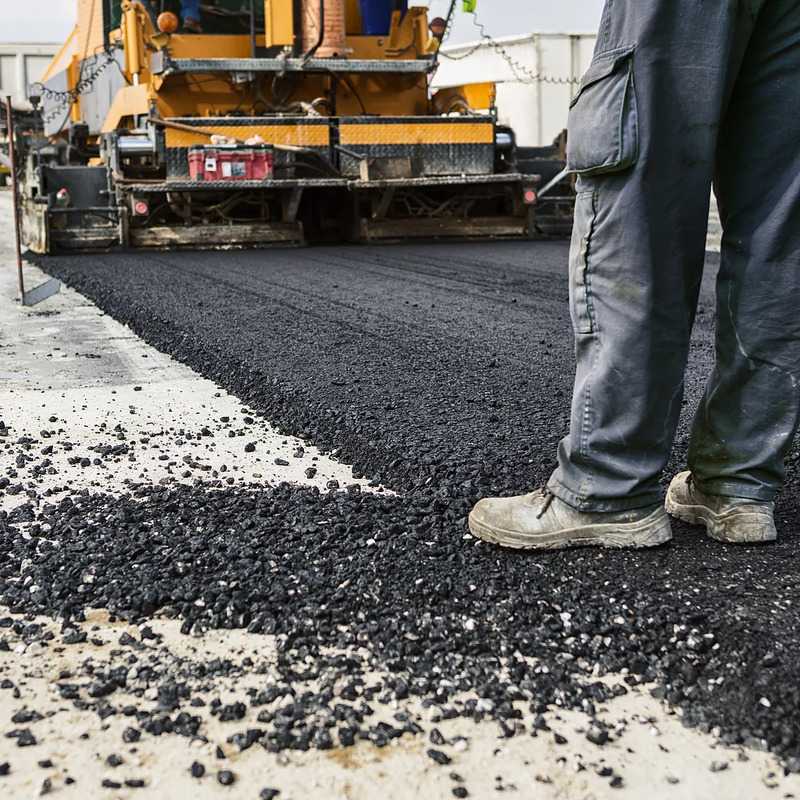 Both properties significantly influence pavement construction operations and the long-term performance of the pavement. 4. Restrict the development of excessive permanent deformation (rutting) in the sub grade during the service life of the pavement. When the sub grade does not possess these attributes, corrective action in the form of a sub grade treatment is needed. 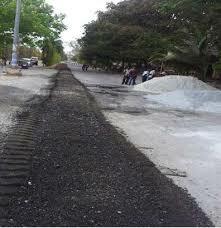 The life of road depends on strength of the sub grade soil and traffic density. The sub grade soil is not uniform throughout the alignment of the road. Generally the poor sub grade soil having soaked Indian Bearing Ratio (IBR) value less than 2% is replaced by good quality sub grade material. The additive like RBI Grade 81is used to improve the properties of sub grade soil. 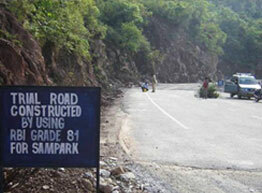 The cost of construction of road increases, if only RBI Grade 81 is used as a stabilizer. The IBR value of sub grade soil can be improved by using moorum with RBI Grade 81and cost of construction can be reduced to certain extent. From IBR test, it is found that the soaked CBR value of soil is improved by 476.56% i.e. 2.56% to 14.76% by stabilizing soil with 20% moorum and 4% RBI Grade 81. The various mixes of soil: moorum: RBI Grade 81 for the different 8 proportions were tested for maximum dry density (MDD), optimum moisture content (OMC) and soaked IBR value.RBI Grade?81 has been invented to provide comprehensive and irreversible soil stabilization specifically for road construction. Treated soil is water resistant & prevents damage to the road foundation and provides better ride-ability & longer durability leading to reduced pavement maintenance cost (38,39). The sub grade in flexible pavement is more vulnerable to failure under the vehicular traffic loading due to non- uniform distribution of the load from overlying layers and the presence of high moisture contents. This layer gets less emphasis compared to other layers in pavement, despite the fact that most of the pavement failure is being caused due to the bearing capacity failure of the sub grade layer. Some sub grade soils, especially clayey soils, have great strength at low moisture content; however they become very weak and less workable with the increase in water content beyond the optimum value. Such soil should be either replaced with superior quality fill material or treated with suitable treatment process (Prusinski and Bhattacharja, 1999). The replacement of the sub grade soil might not always be the best option due to associated hauling cost of the excavated materials as well as the imported quality materials. In some developing regions or even urban areas, the unviability of the aggregate or the shortage of the suitable fill materials makes replacement of weak sub grade soil uneconomical. 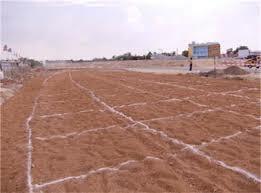 In such conditions, the strength/stiffness properties of the existing weak sub grade soil can be improved by the use of proper compaction technique as well as by using some chemical stabilizers. Portland cement, lime and fly ash are the most common types of chemical stabilizers used by most of states to stabilize the weak sub grades; thus creating a proper working platform and/or sub base layer for pavement construction. a) Surface course: This is the top layer and the layer that comes in contact with traffic. It may be composed of one or several different HMA sub-layers. 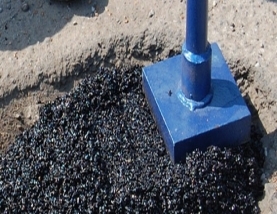 HMA is a mixture of coarse and fine aggregates and asphalt binders with or without additives. b) Base course: This is the layer directly below the HMA layer and generally consists of aggregate (either stabilized or un-stabilized). c) Sub-base course: This is the layer (or layers) under the base layer. A sub-base is not always needed. 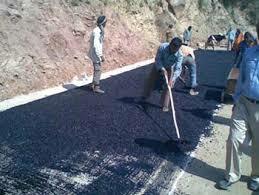 d) Sub grade course: The sub grade is the material upon which the pavement structure is placed. 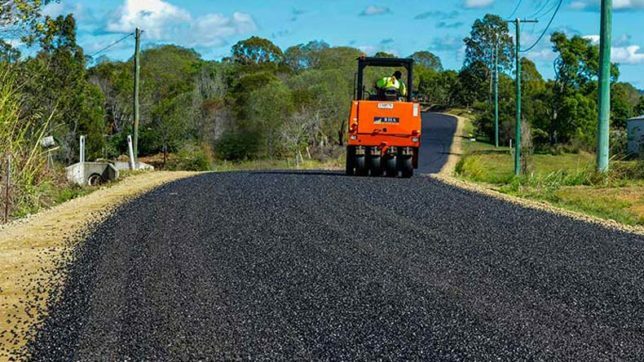 Although there is a tendency to look at pavement performance in terms of pavement crust structure material, mix design and thickness but the sub-grade can often be the overriding factor in the overall pavement performance. The IBR value of the sub grade material is generally used to design the total pavement crust thickness as per IRC: 37-2013-2015 guidelines. A flexible pavement structure is typically composed of several layers of material with better quality materials on top where the intensity of stress from traffic loads is high and lower quality materials at the bottom where the stress intensity is low. Flexible pavements can be analyzed as a multilayer system under 10 loading and are constructed by using different layers such as Bituminous concrete (BC), Dense Bituminous Macadam (DBM), Bituminous Macadam (BM), Wet Mix Macadam (WMM) and Granular Subbase (GSB) as per the MORTH specifications with the designed thickness as per the IRC: 37-2013-2015. 1. Cylindrical mould with inside dia 150 mm and height 175 mm, provided with a detachable extension collar 50 mm height and a detachable perforated base plate 10 mm thick. 2. Spacer disc 148 mm in dia and 47.7 mm in height along with handle. 3. Metal rammers. Weight 2.6 kg with a drop of 310 mm (or) weight 4.89 kg a drop 450 mm. 4. Weights. One annular metal weight and several slotted weights weighing 2.5 kg each, 147 mm in dia. with a central hole 53 mm in diameter. 5. Loading machine. With a capacity of at least 5000 kg and equipped with a movable head or base that travels at an uniform rate of 1.25 mm/min. Complete with load indicating device. 6. Metal penetration piston 50 mm dia and minimum of 100 mm in length. 7. Two dial gauges reading to 0.01 mm. 8. Sieves. 4.75 mm and 20 mm I.S. Sieves. 9. Miscellaneous apparatus, such as a mixing bowl, straight edge, scales soaking tank or pan, drying oven, filter paper and containers. Standard load (kg) 2.5 5.0 7.5 10.0 12.5 1370 2055 2630 3180 3600 I.S. sieve. Prepare the specimen either by dynamic compaction or by static compaction. · Take about 4.5 to 5.5 kg of soil and mix thoroughly with the required water. Fix the extension collar and the base plate to the mould. Insert the spacer disc over the base. Place the filter paper on the top of the spacer disc. · Compact the mix soil in the mould using either light compaction or heavy compaction. For light compaction, compact the soil in 3 equal layers, each layer being given 55 blows by the 2.6 kg rammer. For heavy compaction compact the soil in 5 layers, 56 blows to each layer by the 4.89 kg rammer. · Remove the collar and trim off soil. · Turn the mould upside down and remove the base plate and the displacer disc. · Weigh the mould with compacted soil and determine the bulk density and dry density. · Put filter paper on the top of the compacted soil (collar side) and clamp the perforated base plate on to it. · Calculate the weight of the wet soil at the required water content to give the desired density when occupying the standard specimen volume in the mould from the expression. · Take the weight W (calculated as above) of the mix soil and place it in the mould. · Place a filter paper and the displacer disc on the top of soil. · Keep the mould assembly in static loading frame and compact by pressing the displacer disc till the level of disc reaches the top of the mould. · Keep the load for some time and then release the load. Remove the displacer disc. · The test may be conducted for both soaked as well as unsoaked conditions. · If the sample is to be soaked, in cases of compaction, put a filter paper on the top of the soil and place the adjustable stem and perforated plate on the top of filter paper. · Put annular weights to produce a surcharge equal to weight of base material and pavement expected in actual construction. Each 2.5 kg weight is equivalent to 7 cm construction. A minimum of two weights should be put. · Immerse the mould assembly and weights in a tank of water and soak it for 96 hours. Remove the mould from tank. · Note the consolidation of the specimen. · Test Place the mould assembly with the surcharge weights on the penetration test machine. · Seat the penetration piston at the center of the specimen with the smallest possible load, but in no case in excess of 4 kg so that full contact of the piston on the sample is established. · Set the stress and strain dial gauge to read zero. Apply the load on the piston so that the penetration rate is about 1.25 mm/min. · Record the load readings at penetrations of 0.5, 1.0, 1.5, 2.0, 2.5, 3.0, 4.0, 5.0, 7.5, 10 and 12.5 mm. Note the maximum load and corresponding penetration if it occurs for a penetration less than 12.5 mm. · Detach the mould from the loading equipment. Take about 20 to 50 g of soil from the top 3 cm layer and determine the moisture content. · Period of soaking 96 hrs. (4days). If the initial portion of the curve is concave upwards, apply correction by drawing a tangent to the curve at the point of greatest slope and shift the origin. Find and record the correct load reading corresponding to each penetration. Where PT = Corrected test load corresponding to the chosen penetration from the load penetration curve. 1. When the stabilizers like lime and cement are added, the value of the I.B.R increases up to a certain limit but after that the I.B.R value continuously decreases when further stabilizers are added. 2. As in the case of cement stabilization, the I.B.R. increases up till addition of 8% cement content but on further increase in cement content i.e. 12% there is hardly any increase in value of I.B.R. and on further addition of cement content i.e. 15%, the value of I.B.R. reduces drastically. 3. Likewise is the case with the lime stabilization, the value of the I.B.R value first of all increases up to a certain limit but after that the value start to decrease when we add more lime to it. In the field of stabilization of sub grades, there is a bunch of possibility for further work. Similar stabilizations can be done using diverse other materials available, most important being RBI Grade 81. It is a very new patented material and has a large scope in research work. Stabilizations can be performed on various types of soils. The stabilization can also be done with different combinations of stabilizers like cement and lime mixed together and so on.